NEW BRITAIN - Those craving a typical New England snowstorm may get just that Tuesday as up to 6 inches of snow is forecast to blanket Central Connecticut and areas to the north and west. WFSB meteorologists forecasted Monday afternoon that the snow is expected to start falling around midday Tuesday. The precipitation is supposed to convert to freezing rain by 10 p.m. and then continue through the Wednesday morning commute until about 8 a.m. The EOC is the state’s Emergency Operations Center and 2-1-1 can be called by those looking for warming shelters. Mayor Erin Stewart said roads will be pre-treated in the city and crews are ready. Despite some area residents saying initial response to the last snowstorm was inadequate, Stewart said improvements were made in response to the last storm, like driver and manager communication changes. “As with any city operation, we are continually evaluating the delivery of our services and looking for ways to become more efficient,” Stewart said in an email. 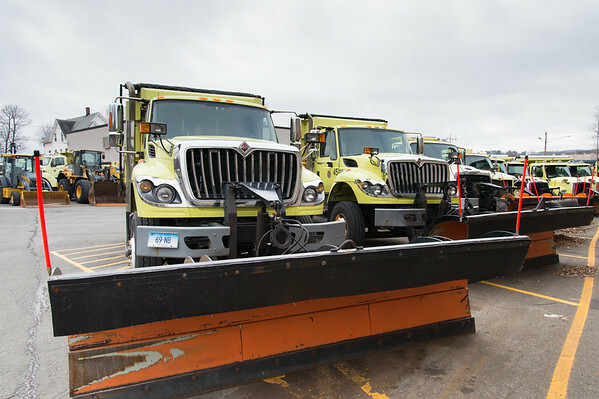 The city’s snow response fleet has 15 large trucks, two trucks for dead ends/side streets, two trucks for parkside operations and two machines to clear the 15 miles of city-owned sidewalks, said David Huck, public affairs specialist in the mayor’s office. The city has about 170 road miles across 13 snow routes. Users on Facebook responded Monday to a question by The Herald asking if New Britain will be ready for the storm, mostly with doubts on the city’s efforts. “They definitely messed up 1st storm but I believe lesson was learned #positivethinkingnooneisperfect,” said Dorothy Ziemak. A parking ban in New Britain will go into effect at 10 a.m. Tuesday and will likely continue through to early Wednesday afternoon, Police Capt. William Steck said. Parking will be prohibited on all city streets while the ban is in effect, and free parking will be available at Osgood Park, Stanley Golf Course, Quonset hut parking lot at 655 Slater Road, city parking lot at Wildwood St. and Linden St. (next to police substation), Washington Park (lot opposite Gold Street), Martha Hart Park, city parking garages Bank St./Chestnut St. and Columbus Boulevard at the corner of Washington St., and the Pulaski Club at 89 Grove St. Violators will be fined $100 and have their vehicles towed at the owner’s expense. A parking ban will also go into effect in Southington at noon on Tuesday and remain in place until 6 a.m. Wednesday. According to Plainville police, an emergency parking ban had not been announced as of about 2:30 p.m. Monday. However, Plainville police Lt. Eric Peterson said police always encourage residents to refrain from parking on the street during winter storms. In addition to calling 2-1-1 for warming shelters, women and families can go to the Friendship Service Center located at 241 Arch St., and the New Britain Salvation Army, 78 Franklin Sq., Those looking for temporary refuge are allowed to go into the lobby of the police department. Schools in New Britain and New Britain Superior Court will be closed Tuesday in honor of Lincoln’s birthday. Newington Interim Superintendent of Schools Pamela S. Muraca had not made a decision regarding school closures Monday afternoon. Berlin Superintendent of Schools Brian Benigni did not return a request for comment Monday on if schools would be canceled. Berlin and Newington town staff did not return requests for comments on their storm preparation. Kevin Nursick, spokesperson for the state’s DOT, said the state’s 634 trucks, 200 private contractors and staff out of its 50 satellite locations throughout the state will be ready to go. Areas more prone to be problematic from snow and ice, like bridge surfaces and hills and valleys, will be treated with a saltwater solution that delays the onset of precipitation on the road and prevents binding between the two after the storm. During the storm, rock salt will be spread on the roads. “It’s strategic,” Nursick said of the state’s efforts during the storm. Cautious driving in cars that are winter ready, as in equipped with snow tires, is encouraged, Nursick said, regardless of what condition the roads are in. The website cttravelsmart.org should be visited for real time camera footage of road conditions and more, Nursick added. No alteration to the schedule for public buses and trains was made as of Monday afternoon, Nursick said. Posted in New Britain Herald, New Britain on Monday, 11 February 2019 20:26. Updated: Monday, 11 February 2019 20:29.